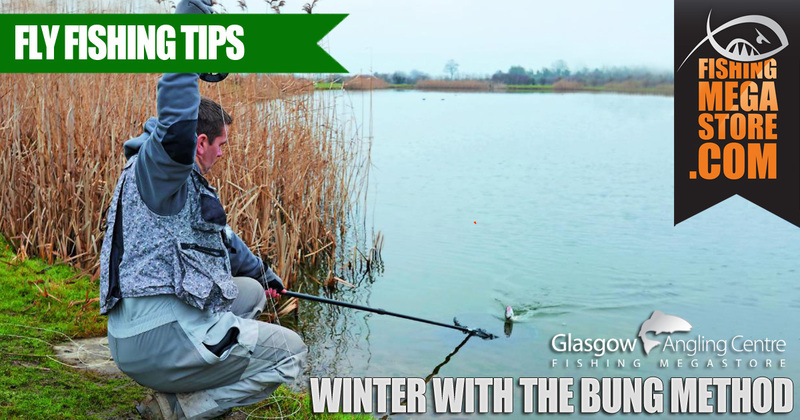 Fish are not as visibly active in winter and don’t need as much food, so this requires a different approach. 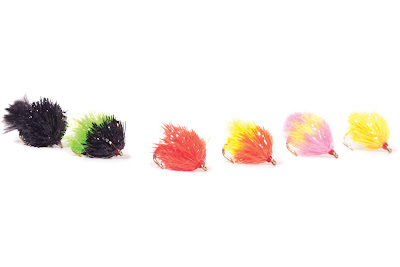 Once you have fished imitatively or have tried lures, the static - in their face - approach is a winner, and that means it's time for ‘the Bung’. 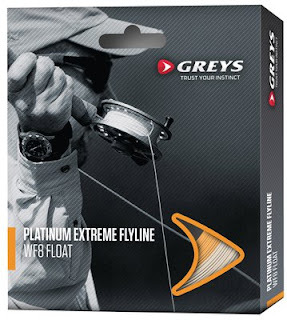 Often derided as nothing other than ‘float fishing’, there’s seemingly no problem if you use a big deer hair dry as the indicator, but somehow the foam/plastic or yarn indicator isn’t met with the same approval in some camps. It does the same thing though, so how do you fish it? There’s no doubt that trout in winter prefer cruising at a comfortable depth. Soon after light, they’re mostly below six feet, and around midday might well come up near the surface only to go down again as the late afternoon temperatures drop away. The beauty of the bung technique is that you can adjust your fishing depth, and by using two flies, you can gauge which is the most effective and move the dropper closer to the point. That way, both flies are in the zone. 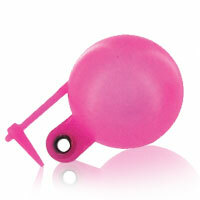 When you set out to fish the bung, try experimenting with the depth and position of your bung accordingly. 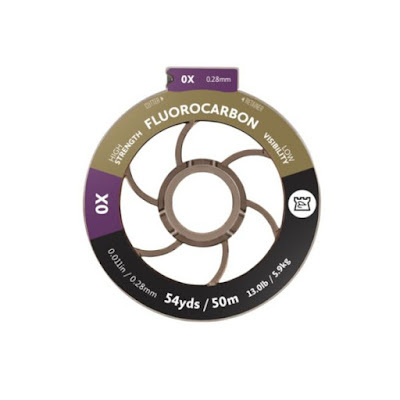 For example, if you were using a 12ft, single length of fluorocarbon, you could place the bung 3 feet from your fly line-to-leader connection, therefore fishing your point fly at 9ft. 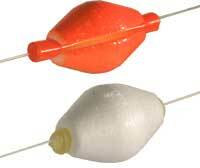 Initially, you would have the flies around 4ft apart, so your dropper will be fishing at 5ft. This tactic gives you more coverage than if you were fishing a single fly. 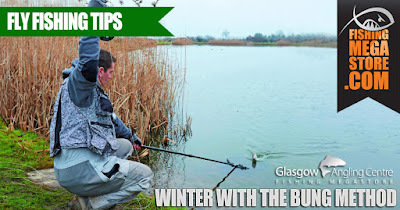 Any combination of nymphs will work, but in winter, the blob in conjunction with a simple buzzer/nymph on the dropper and trout will look at the blob – and may well take it. 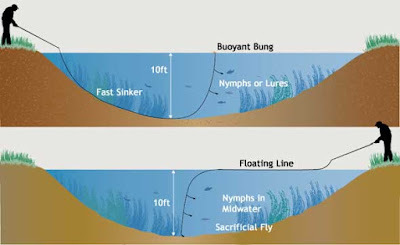 The blob acts as an attractor which can lure trout in, and when they spot the smaller nymph pattern, they may decide to take it instead. A similar combo is a multi-legged Bloodworm on the point or even an Egg Fly, but be wary of this latter pattern in catch and release waters as trout can swallow it right down. Don’t worry about casting any distance or about just leaving it to ‘fish’ without constantly retrieving. 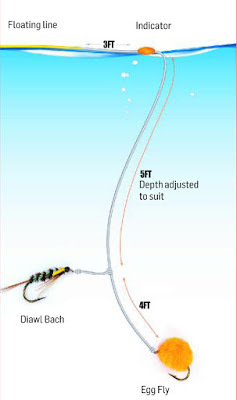 Remember, the indicator is an 'in their face' style, which is essentially a no-retrieve technique, although letting the rig drift with the breeze can work. If you are fishing the downwind shore, you may well come across a back current where your indicator will seem to be going against the wind. This is because there’s a sub-surface current opposite to the wind direction and it can be enough of a tow on the sunk flies to actually make the indicator move against the wind, and there’s nothing wrong with this. 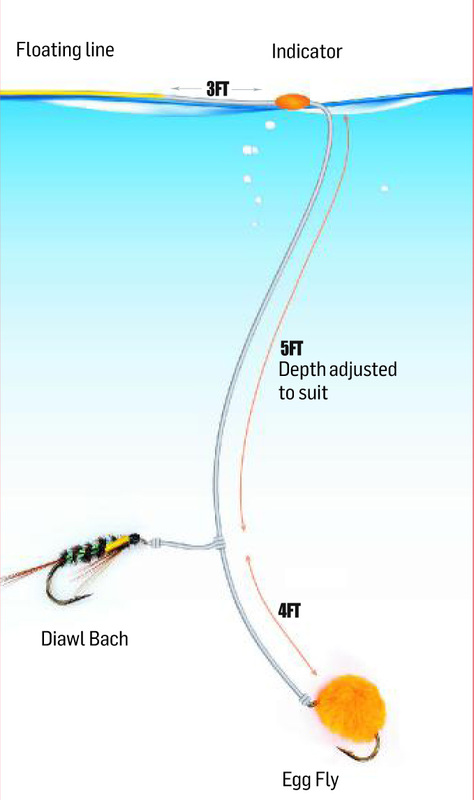 If you have a surface drift which puts a loop in the fly line then it will pay to learn how to mend the line to negate the effect of the loop pulling the indicator along too fast. Also, if you are not in contact with the bung, when it comes to striking, you have minimised the chance of a hook-up because you are lifting slack line and wasting valuable seconds. Any downward dip of the indicator or indeed any obvious check in its drift should be met with an immediate strike. However, don't just wait for the indicator to fully submerge before striking! Sometimes the subtlest movement in the indicator can be a fish inspecting or having a 'nose' at the flies, so in this case, 'firmly', not aggressively, lift the rod because you could potentially get a hookup! On the coldest days, start mid-morning and skip lunch to finish mid-afternoon so that you are concentrating your efforts during the peak hours. Make up a few spare leaders on circular foam rig holders. That way it’s easy to then get back into action after a foul-up and it avoids having to tie knots when your hands are cold and stiff. Banks are super slippery in winter from mud and frost so move carefully and have decent cleats on your boots. A few wader studs screwed into the heel can avoid an embarrassing or painful fall. Keep in touch with the bung/line/flies at all times. Any slack when you strike will decrease your chances of a hookup. Occasionally, give the fly line a gentle pull to simulate an emerging buzzer or nymph trying to reach the surface. This slight movement could trigger a response if fish are in the proximity of the flies. Again, don't wait for the bung to fully submerge before striking! The slightest nudge could be a fish, so strike. You will be surprised! !